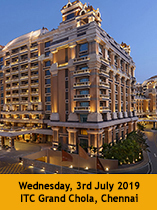 After the immensely successful South East CEO Conclave and Awards 2018 held in June last year, Exim India Shipping Times is back with the 11th edition of the South East CEO Conclave and Awards 2019, scheduled on Wednesday 3rd July 2019 at ITC Grand Chola, Chennai. The CEO Conclave will see some of the top decision makers from the maritime, cargo and logistics industry, besides policy formulators and regulatory authorities, participate in a wide-ranging and stimulating deliberation on the issues pertaining to the sector in South and East India. New paths and innovative strategies will be explored to give a further fillip to the industry and general trade in the region. 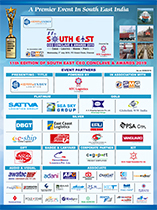 Thus, South East CEO Conclave and Awards 2019 will again affirm the event’s status as the definitive avenue for thought-provoking discussion and recognition of excellence in the sector.